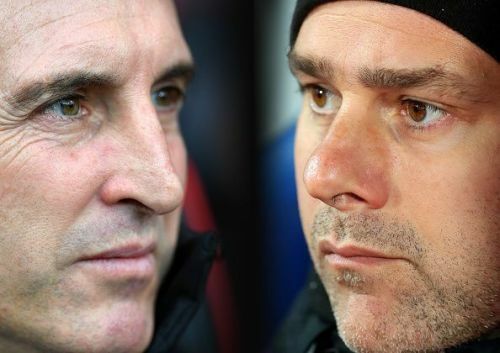 Ahead of their derby clash later tonight, Arsenal boss Unai Emery has admitted that Mauricio Pochettino's Tottenham Hotspur are the better side of the two. Arsenal are set to host Tottenham Hotspur in a much-awaited derby that will be crucial for their top-four hopes in the Premier League. The game will also mark the first time that old friends Unai Emery and Mauricio Pochettino will meet in the English top flight. Pochettino's Spurs side are currently at third place on the table, three points clear of their North London rivals Arsenal who are in fifth place. Ahead of the clash, Emery has acknowledged his rivals by admitting that they are the better side. The Gunners boss said, (via Sky Sports), "At the moment, Tottenham is better than us in the table and better than us last year but in history, Arsenal is better at other moments than Tottenham." "I think we are going to live with two (sets of) supporters and I think it will be a very good atmosphere." "The first match is in our stadium and with our supporters and we want on Sunday to give them the best performance and can give them our energy and our things on the pitch to help them push us." Emery drew a comparison with the Sevilla derby back when he was in charge of the Spanish club saying, "The Seville derby is very, very passionate." "I lived different derbies like Real Sociedad vs Athletic Bilbao, like CSKA Moscow vs Spartak, PSG vs Olympique Marseille." "Sevilla vs Betis is with the passion because they are two teams with very big and passionate supporters and here in England I think I am going to live Sunday the first derby and think it is similar with the passion." "Sometimes in the history, Sevilla is better and sometimes Betis are better. I think here it is the same." Tottenham have not won at the Emirates since 2010 and it remains to be seen whether Arsenal will join the Spurs at 30 points with a victory.